In business, we always hear that the company is running at huge profit or loss. The profit and loss calculation is the important thing in business as well as in competitive examination. Each year and each competitive examination ask one or several questions from this chapter, where Mathematics is enlisted as the part of the syllabus. So we need to know the core concept of Profit and loss section to score well in our competitive examination, and also we should earn the ability to solve this aptitude in the shortcut and tricky method to save our time in the competing exam hall. Profit: A seller got extra money from the cost price. Where cost price is the price money spent seller before selling a product. Loss: Loss is the opposite of profit, means the less price from the cost price. Mark Price: -The seller or producer of the product write the price money on the sticker of the product. Usually, it is higher than the cost price. Selling price: - A price which gives the customer to the seller. Discount: - Sometime and somewhere seller take less amount of the client than the market price to attract customer for selling more product. 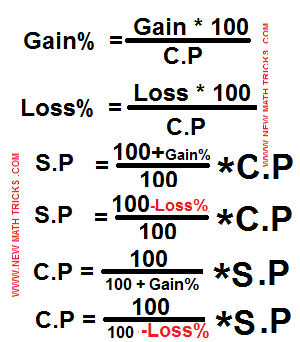 It is the essential thing to know before the Profit and Loss aptitude formula in shortcut method. So now we are moving to the shortcut formula of profit and loss chapter. I have put all the formula on the images. Clearly, you can observe and find out the answer by using above formula. Where minimum three data from C.P, S.P, loss percentage and the gain percentage has given and ask one of them. It was the basic formula for the math chapter Profit and Loss. In the next profit and loss aptitude tutorial, we will discuss each formula with aptitude question and solution. Also you will know how to apply formulas on advance or exam level aptitude to execute correct answer.